Logging is an important aspect of any professional web application. You often need to log data, information, errors, system events, and such things. ASP.NET Core comes with a set of inbuilt logging components that you can use for this purpose. To that end this article enumerates through seven things that are worth knowing about ASP.NET Core logging. 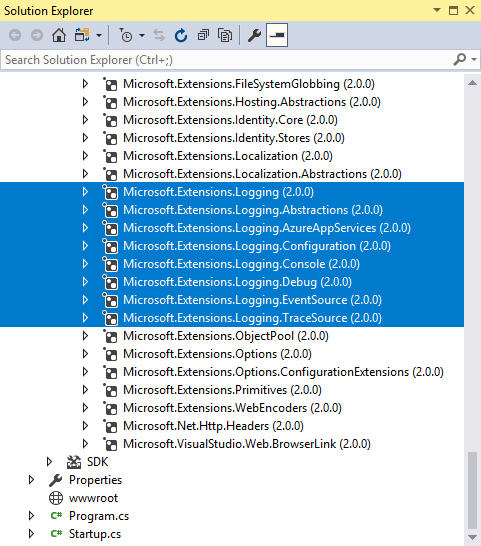 The inbuilt logging functionality of ASP.NET Core is bundled in the Microsoft.Extensions.Logging namespace. When you create a new ASP.NET Core 2 project the relevant NuGet packages are already included in the Microsoft.AspNetCore.All metapackage. If they are not added to your project for some reason you should ensure to add them as shown above. The ILogger interface contains methods that write the specified information to a log storage. The ILoggingProvider creates an ILogger object. The ILoggingFactory creates an ILogger using a ILoggingProvider. The LoggerFactory class is a concrete implementation of ILoggingFactory. The ConsoleLogger writes the log messages to the system console. The DebugLogger outputs the log information to Visual Studio debug window. The other logger classes log messages to their respective stores (for example, Windows event log). As you can see you the code uses AddEventSourceLogger() and AddEventLog() methods to register event source logger and event log logger with the system. Your log messages will now be sent using Windows event log and Windows Event Tracing (ETW) respectively. As you can see, the above code receives a DebugLogger in the constructor. You can then use this ILogger implementation to log the messages. The razor pages use similar approach. The following code shows the DebugLogger being injected into a page model. You can also use Log() method and explicitly specify details such as log level and event ID. The usage of these log methods in razor pages is identical to MVC applications. 0 - Tracing : Tracing purpose messages. 1 - Debug : Short term debugging purposes. 4 - Error : Errors and exceptions that can't be handled by your code. 5 - Critical : Serious system failures or errors. As you might have guessed the logging methods discussed earlier are meant for the corresponding log levels. For example, LogInformation() method is intended to log a message with log level of 2. LogError() is intended to log a message with log level of 3 and so on. To read more about error logging in ASP.NET Core go here. That's it for now! Keep coding ! !